The Apple Store is advising some of its customers electing to pick up their iPhone XS and iPhone XS Max orders in-store that they are unable to do so first thing on Friday, due to "last minute logistical issues" that likely involves a delay or a shortfall of devices making it in time to the outlets. But, the delay may be for less than a day in most cases. 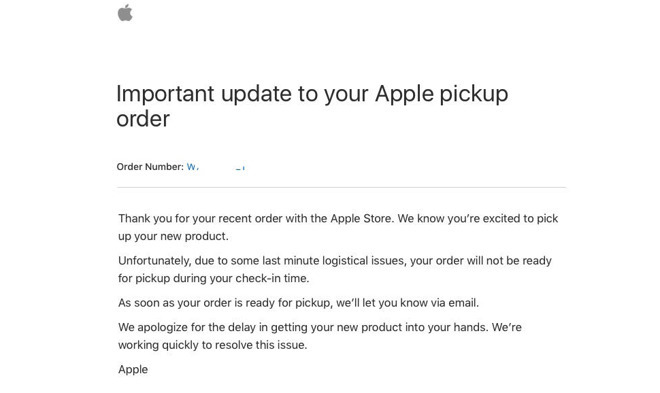 An email sent to affected customers by Apple advises "Unfortunately, due to some last minute logistical issues, your order will not be ready for pickup during your check-in time. As soon as your order is ready for pickup, we'll let you know via email." The message goes on to apologize for the delay, and that the company is working to resolve the issue as quickly as possible. The Apple Stores that AppleInsider contacted all reported that there were shipping issues at a rate "more than normal" leading to less-than-expected stock at opening. As a result, this appears to be leading to the notifications sent to some customers on Friday morning. According to sources inside Apple not authorized to speak on behalf of the company, the number of people who can't pick up orders previously scheduled for Friday morning is still low, albeit higher than in previous years. However, all but one of the stores we asked said that the shipments are still expected today for these customers, with many being processed by store staff early in the afternoon. The reasons behind the store pickup delays are plausibly connected to issues relating to deliveries. On Thursday night, delivery updates for UPS started to update its estimates for some users to a Monday arrival rather than Friday, though the courier claims this to be an error.